Showing items in category Anguilla, sorted by newest listed first. ANGUILLA - 1967 3c 'Independent Anguilla' adhesive used with INVERTED WATERMAK. SG 4w. 1967 3c 'Gateway' Independence Anguilla adhesive in fine used condition showing the variety WATERMARK INVERTED. Complete with RPS certificate. SG 4w. ANGUILLA - 1965 25c 'Independent Anguilla' adhesive used with INVERTED WATERMAK. SG 11w. 1967 25c 'White Crowned Pigeon' Independence Anguilla adhesive in fine used condition showing the variety WATERMARK INVERTED. Complete with RPS certificate. SG 11w. ANGUILLA - 1967 3c 'Independence Anguilla' overprint adhesive used. SG 4. 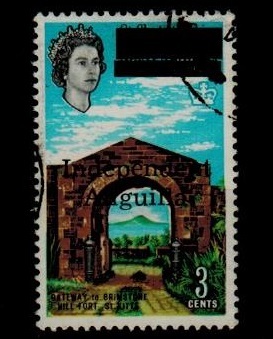 1967 3c 'Gateway Brimstone Hill Fort' Independence Anguilla overprint adhesive in fine used condition. SG 4. ANGUILLA - 1967 6c 'Independence Anguilla' overprint adhesive used. SG 7. 1967 6c 'Crater, Mt Misery' Independence Anguilla overprint adhesive in fine used condition. SG 7. 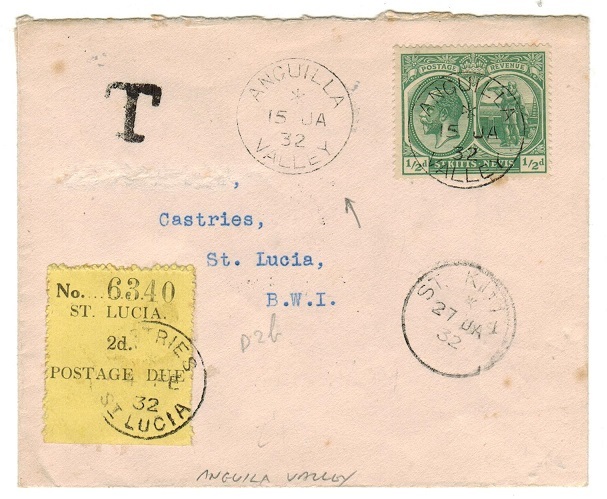 ANGUILLA - 1932 underpaid cover to St.Lucia with 2d 'Postage Due' added with WIDE FOUNT variety. ANGUILLA - 1967 $2.50 'Independence Anguilla' adhesive finely used on piece. H&G 15. 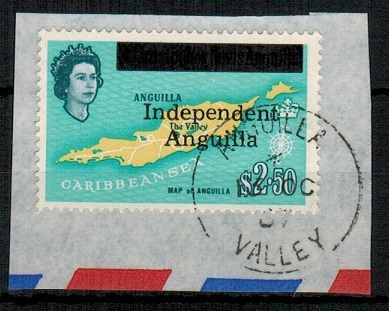 1967 $2.50 'Map Of Anguilla' adhesive overprinted 'Independent/Anguilla' in black tied to airmail piece by complete ANGUILLA/VALLEY cds dated OC.13.67. Very scarce stamp. SG 15. 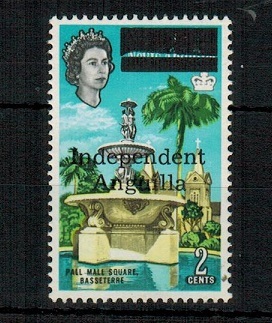 ANGUILLA - 1967 2c 'Independence Anguilla' adhesive U/M. SG 3. 1967 2c 'Pall Mall Square' adhesive in unmounted mint condition. SG 3. 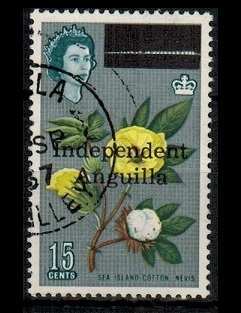 ANGUILLA - 1967 1c 'Independence Anguilla' adhesive U/M. SG 2. 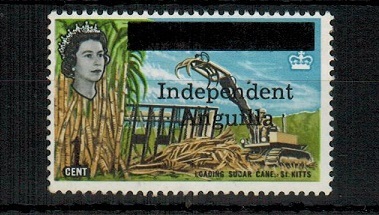 1967 1c 'Loading Sugar Cane' adhesive in unmounted mint condition. SG 2. ANGUILLA - 1969 philatelic use of St.Kitts 5c air letter uprated with 5c 'Independence' stamp. 1969 (FE.12.) 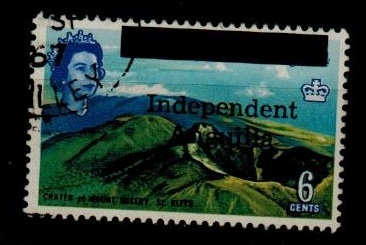 philatelic use (no message/address) of St.Kitts 5c dark blue on blue air letter bearing 5c Anguilla adhesive overprinted INDEPENDENCE/JANUARY 1969 in black and cancelled ANGUILLA/VALLEY. These overprinted stamps saw little use. 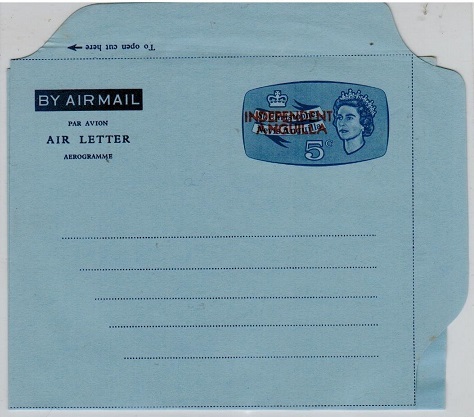 ANGUILLA - 1967 5c blue unused air letter overprinted INDEPENDENT/ANGUILLA. H7G FG1. 1967 5c blue on light blue postal stationery aerogrammed sheet in fine unused condition overprinted INDEPENDENT/ANGUILLA in red with IMPERIAL/AIR MAIL watermark. A scarce item. H&G FG1. 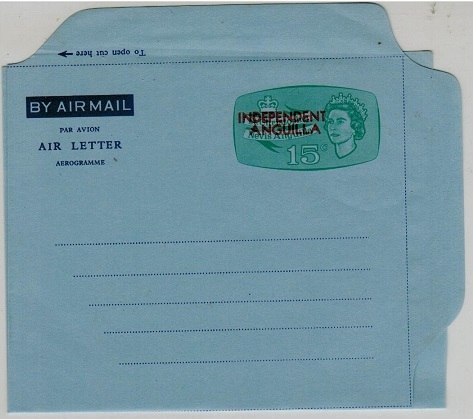 ANGUILLA - 1967 15c pale green on blue unused air letter overprinted INDEPENDENT/ANGUILLA. H&G FG2. 1967 15c pale green on light blue postal stationery aerogramme sheet in fine unused condition overprinted INDEPENDENT/ANGUILLA in red with IMPERIAL/AIR MAIL watermark. Of the 100 originally printed only 5 examples are recorded known mint. Exceedingly rare and must be the scarcest of all QEII stationery. H&G FG2. ANGUILLA - 1967 1c 'Loading Sugar Cane' U/M with strong OFF-SET on reverse. SG 2. 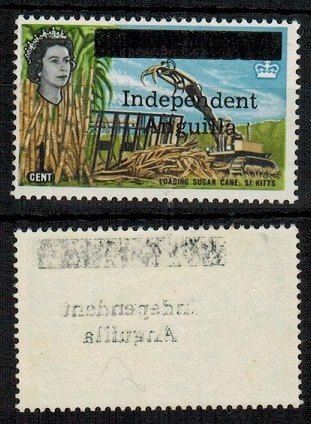 1967 1c 'Loading Sugar Cane' adhesive in unmounted mint condition with strong OFF-SET on reverse. SG 2. 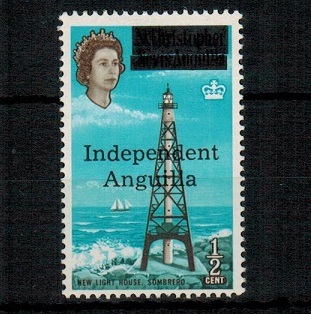 ANGUILLA - 1967 1c 'Independent Anguilla' adhesive fine used. SG 2. 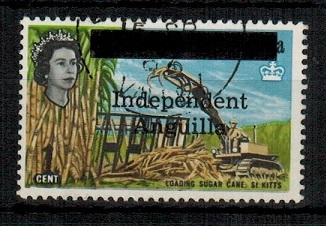 1967 1c 'Independent Anguilla' adhesive fine used. SG 2. 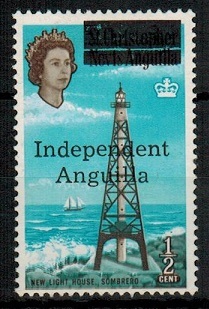 ANGUILLA - 1967 15c 'Independent Anguilla' adhesive fine used. SG 9. 1967 15c 'Independent Anguilla' adhesive fine used. SG 9. 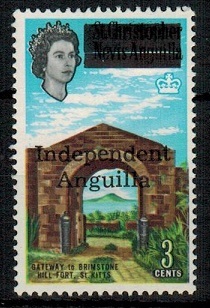 ANGUILLA - 1967 1/2c 'Independent Anguilla' unmounted mint. SG 1. 1967 1/2c 'Independent Anguilla' adhesive in unmounted mint condition. SG 1. ANGUILLA - 1967 3c 'Independent Anguilla' adhesive mint. SG 4. 1967 3c 'Independent Anguilla' adhesive in fine lightly mounted mint condition. SG 4. ANGUILLA - 1967 1/2c 'Independent Anguilla' adhesive mint. SG 1. 1967 1/2c 'Independent Anguilla' adhesive in fine lightly mounted mint condition. SG 1. 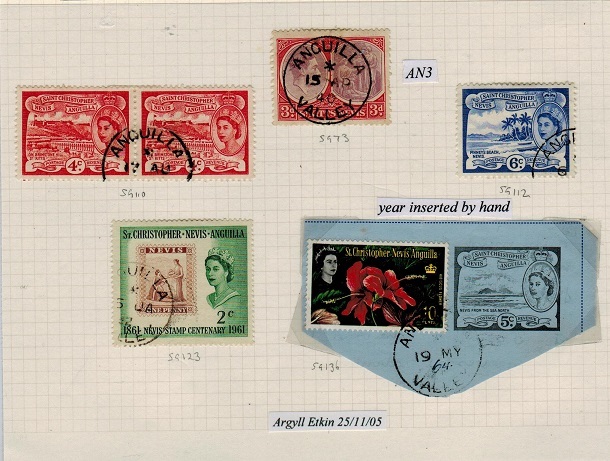 ANGUILLA - 1940 + range of St.Kitts stamps used at ANGUILLA VALLEY. (5 items). 1940 + small range of St.Kitts stamps on album leaf all used at ANGUILLA VALLEY. Includes nice KGVI 3d (SG 73) with central strike and QEII 5c postal stationery air letter cut out uprated with 10c. (5 items). ANGUILLA - 1903 2d ultramarine RPSE of Leeward Islands uprated and used in ANGUILLA. 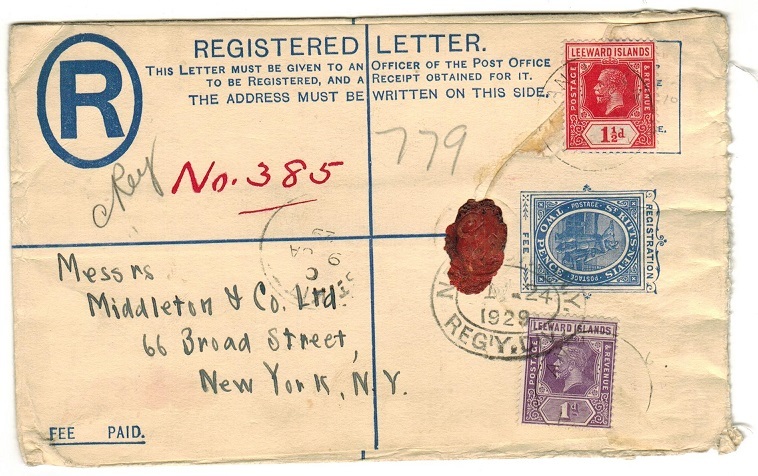 1903 2d ultramarine on cream registered postal stationery envelope (size G) of St.Kitts (H&G 1) addressed to USA and bearing additional Leeward Islands 'key plate' 1d and 1 1/2d adhesives tied by light ANGUILLA cds's with ST.KITTS transit at left dated 9.JA.29. ANGUILLA - 1930 first flight cover to Martinique from ANGUILLA VALLEY via St.Kitts. 1930 (FE.24.) 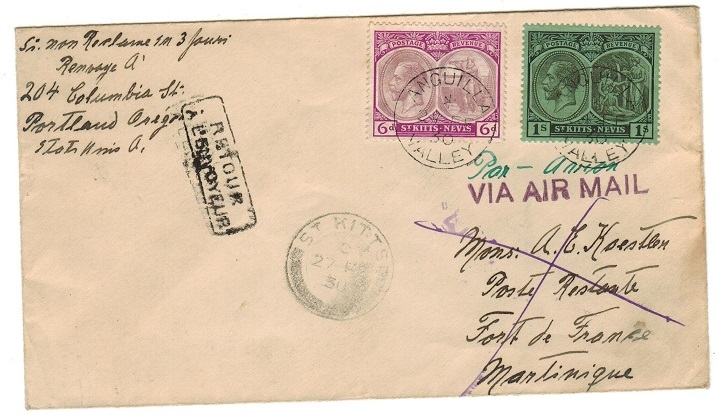 first flight cover addressed to Martinique bearing St.Kitts 6d and 1/- adhesives each cancelled ANGUILLA/VALLEY cds's with ST.KITTS transit strike below 3 days later. ST.JOHNS/ANTIGUA and PORT OF SPAIN transit b/s's having been carried on the Nybra flight from Trinidad on the 8th. The cover was not delivered and was returned with black boxed RETOUR/A L'ENVOYEUR h/s applied. Very scarce use at Anguilla Valley. ANGUILLA - 1969 FPO 1046 cover to UK. 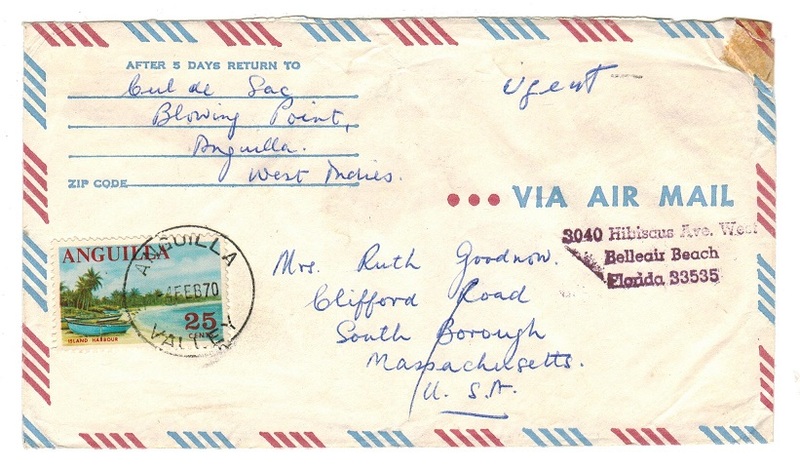 1969 long airmail cover to UK bearing 'GB' 5d adhesive tied by blue FIELD POST OFFICE/1046 cds used by British troops in Anguilla during the unrest. Ex. operation 'Sheepskin' which landed UK troops in Anguilla in March of 1969. 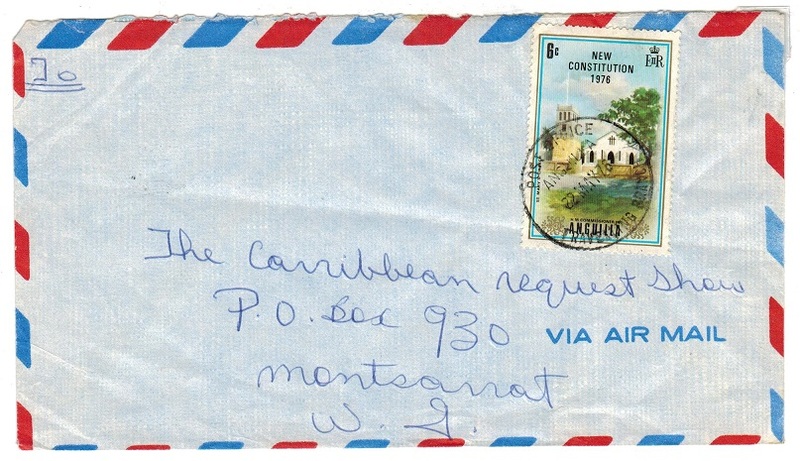 ANGUILLA - 1971 cover to Montserrat used at the TRAVELLING BRANCH office. 1971 (DEC.6.) 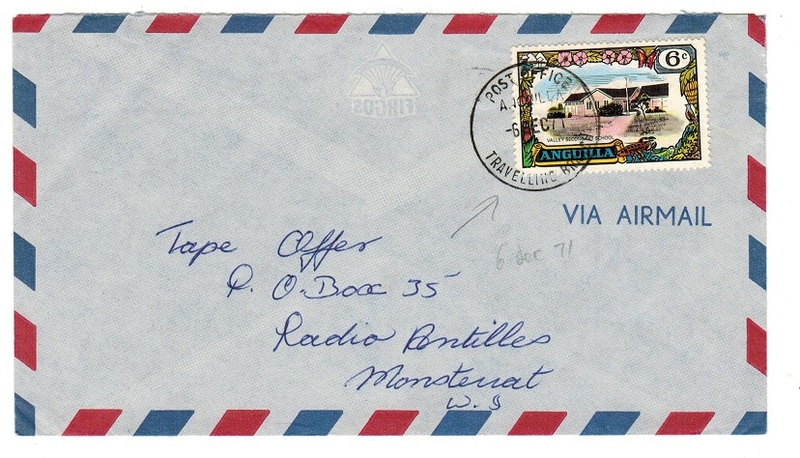 cover addressed to Montserrat bearing 6c adhesive tied by POST OFFICE ANGUILLA/ TRAVELLING BRANCH cds. ANGUILLA - 1947 cover to USA used at ANGUILLA/VALLEY. 1947 (DE.8.) 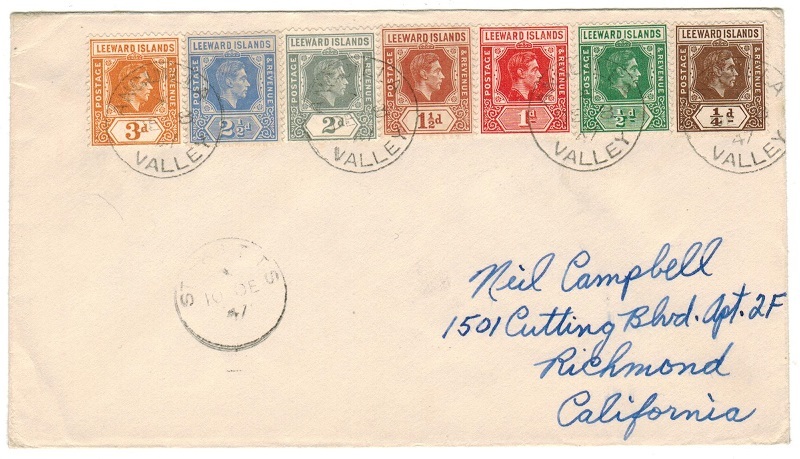 cover addressed to USA bearing Leeward Islands 'key plate' 1/4d-3d adhesives tied by ANGUILLA/VALLEY cds's with ST.KITTS transit cds applied two days later. 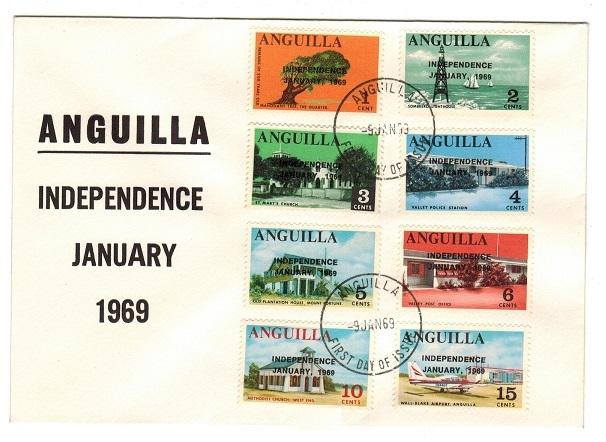 ANGUILLA - 1969 short set to 15c FDC of the INDEPENDENCE issue. 1969 (JAN.9.) official 'short set' ANGUILLA/INDEPENDENCE/JANUARY/1969 unaddressed first day cover bearing the Independence set to 15c tied ANGUILLA/FIRST DAY OF ISSUE. 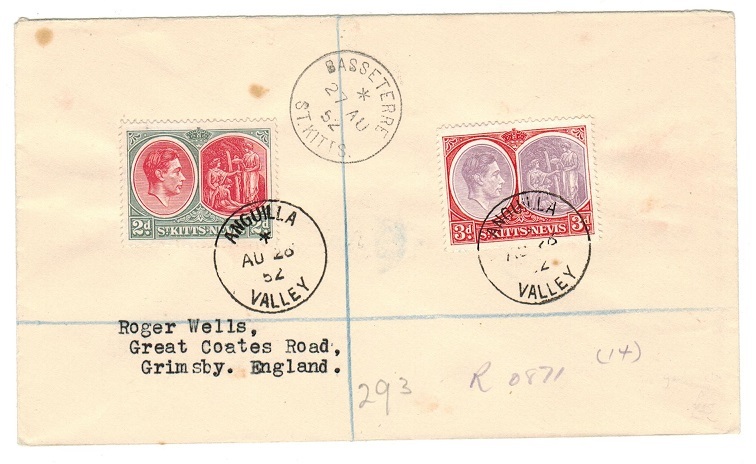 ANGUILLA - 1947 'Victory' pair and 1/2d on cover to UK used at ANGUILLA VALLEY. 1947 (AP.25.) 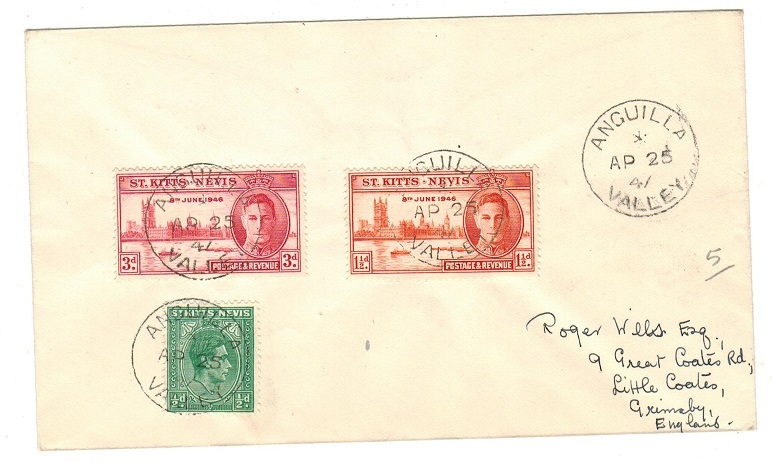 'Wells' cover addressed to UK bearing St.Kitts 1/2d green tied with 'Victory' pair by ANGUILLA/VALLEY cds's. ANGUILLA - 1969 'Independence' series to $5 unmounted mint. 1969 'Expiration Of Interim Agreement on Status' series of 15 values complete to the $5 each overprinted INDEPENDENCE/JANUARY 1969 in unmounted mint condition. These stamps were issued during the conflict of Independence and at that time the country was outside the British Commonwealth. Due to this fact these stamps were not listed by SG until very recently when the set to the 40c was listed (SG52a-52j). Why the top values didn't receive listing is unsure. An interesting period of Anguilla's postal history. 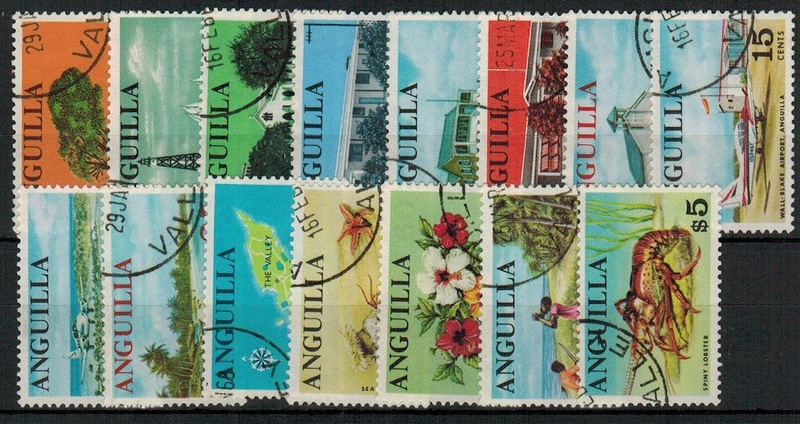 ANGUILLA - 1967/68 'Pictorial' set used. SG 17-31. 1967-68 'Pictorial' set of 15 values to the $5 in fine used examples. SG 17-31. ANGUILLA - 2003 'Sailing Vessels' set of 12 fine used. SG 1131-42. 2003 'Past sailing Vessels' series of 12 of values 15c to $5 all fine used. SG 1131-42. 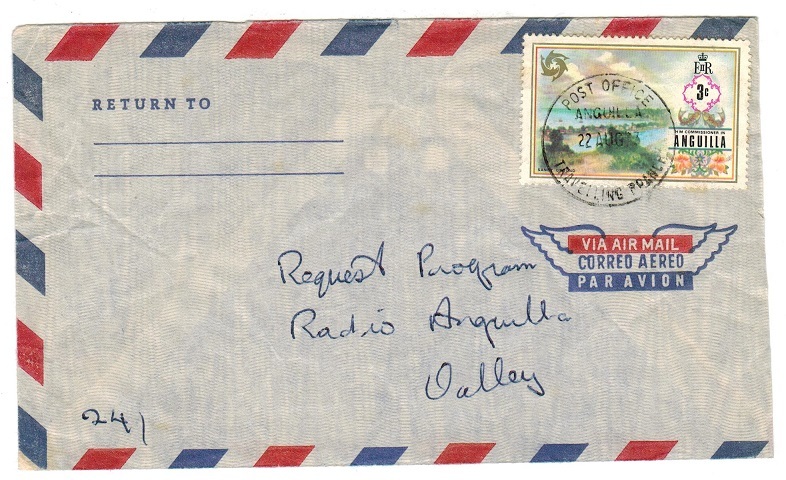 ANGUILLA - 1973 local 3c cover used with TRAVELLING BRANCH cds. 1973 (AUG.22.) 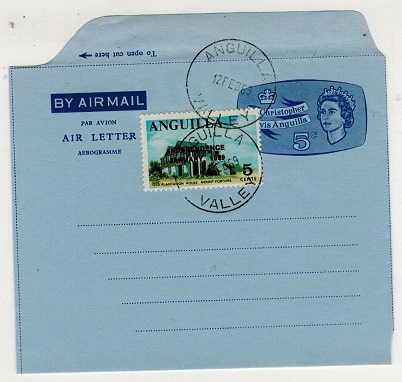 cover addressed locally to Valley bearing 3c adhesive tied by POST OFFICE/ ANGUILLA/TRAVELLING BRANCH cds. 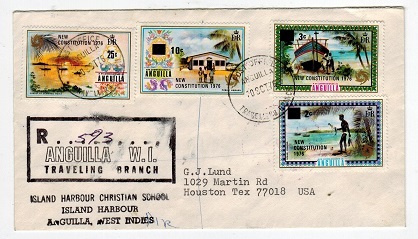 ANGUILLA - 1973 3c cover to USA used with TRAVELLING BRANCH cds. 1976 (MAY.22.) 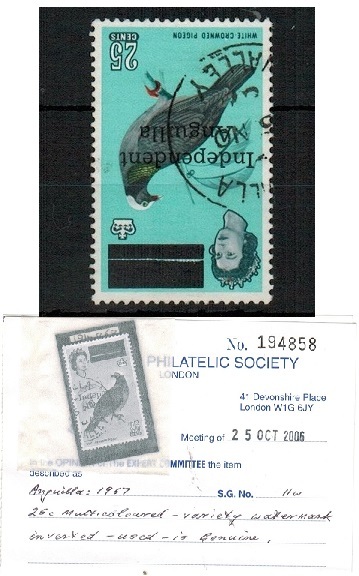 cover to USA bearing 6c 'Constitution' adhesive tied by POST OFFICE/ANGUILLA/ TRAVELLING BRANCH cds. ANGUILLA - 1952 registered cover to UK used at ANGUILLA/VALLEY. 1952 (AU.26.) registered cover to UK (Wells) bearing St.Kitts 2d and 3d adhesives tied by ANGUILLA/VALLEY cds's with BASSETERRE transit cds the following day. ANGUILLA - 1956 registered cover to Canada used at ANGUILLA/VALLEY. 1956 (AP.24.) 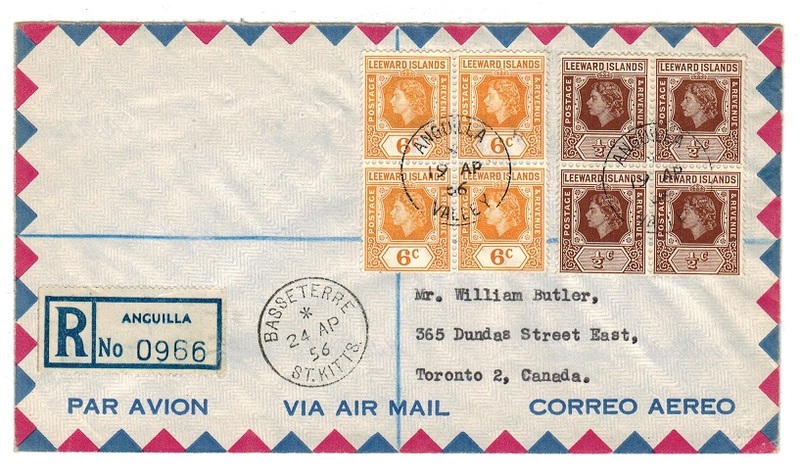 registered cover addressed to Canada bearing 1/2c and 6c QEII 'key plate' blocks of four tied ANGUILLA/VALLEY and with perforated R/ANGUILLA/No. label at left. BASSETERRE/ST.KITTS transit. ANGUILLA - 1970 25c rate cover to USA used at ANGUILLA/VALLEY. 1970 (FEB.4.) 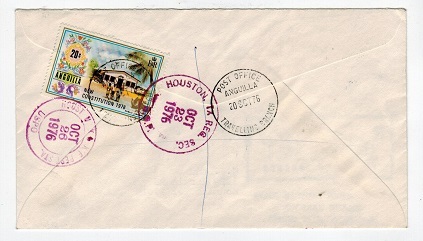 cover addressed to USA bearing 25c (SG 26) tied by ANGUILLA/VALLEY cds. 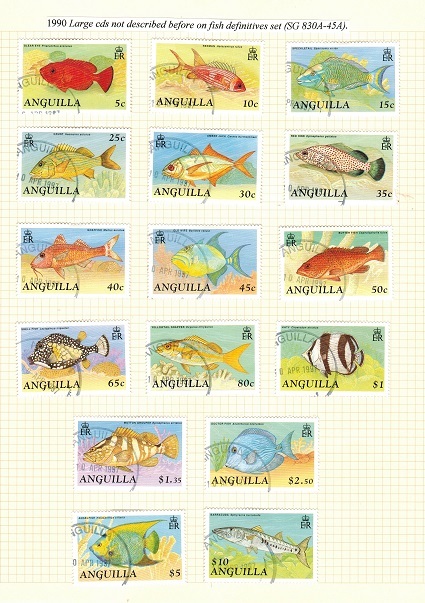 ANGUILLA - 1990 'Fish' definitive set of 16 fine used. SG 830a-45a. 1990 'fishes' definitive set of 16 all fine used arranged on album leaf. SG 830a-845a. ANGUILLA - 1976 ANGUILLA/TRAVELLING BRANCH registered cover to USA. 1976 (OCT.20.) 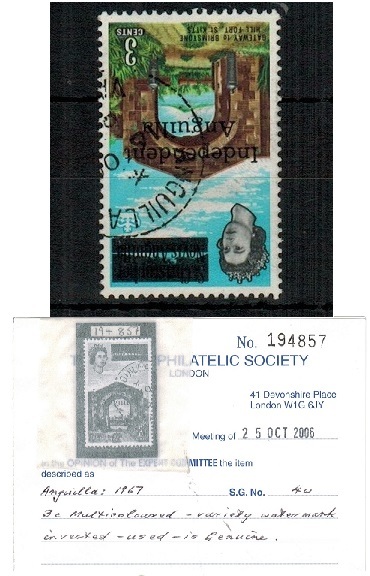 registered cover addressed to USA bearing 2c, 3c and 10c surcharge adhesives with additional 25c 'New Constitution' tied by POST OFFICE/ANGUILLA/TRAVELLING BRANCH cds's with scarce black rubber boxed R/ANGUILLA W.I./TRAVELLING BRANCH registered h/s at left.